The B155-002-DVI 2-Port Mini DisplayPort to DVI Splitter converts and splits a Mini DisplayPort (mDP) video signal for display on two DVI-enabled monitors, projectors or televisions at the same time. Ideal for offices, conference rooms, retail settings, trade shows and classrooms, this compact splitter features a built-in mDP cable that connects to the source. 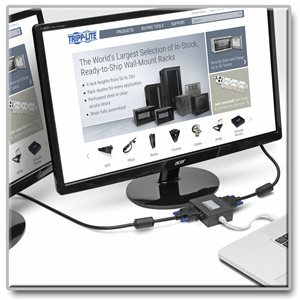 It lets you use your existing DVI displays instead of buying new mDP monitors or docking stations. The B155-002-DVI supports video resolutions up to 1920 x 1080 (1080p) at 60 Hz, as well as HDCP, EDID and DDC. Orange LEDs next to each output port indicate whether the splitter is powered on and transmitting a signal to the connected displays. The B155-002-DVI works with all operating systems and is small enough to carry in your backpack or computer bag. Plug-and-play convenience means no software or drivers are needed. An included USB Micro-B cable connects between the source and the splitter to provide power, so no external power supply is required. The B155-002-DVI is compliant with the Federal Trade Agreements Act (TAA) for GSA Schedule purchases. The B155-002-DVI comes with a three-year warranty. It’s manufactured in compliance with strict RoHS specifications, reflecting Tripp Lite’s commitment to environmental responsibility.